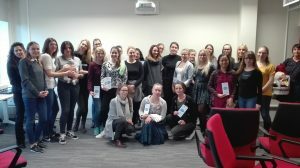 In April 2018, the outcomes of HELP project were presented at Tallinn Health Care College (https://www.ttk.ee/en) within an Erasmus+ meeting. The event was held on 17 April 2018. Students and teacher from were informed about some of the finding from the O1 Need Analysis and were given a brief guidance about how to use the online platform and the mobile app. The presentation raised a lot of interest and the project was very well appreciated by the audience. Colleagues from Bulgaria were also present and agreed to spread the word about the project at their home insituions.